Family Farmed‘s Good Food Festival on Saturday, March 26 is the big annual public celebration that will cap the three-day Good Food Festival & Conference at Chicago’s UIC Forum. The Festival is all about hands-on workshops and learning. 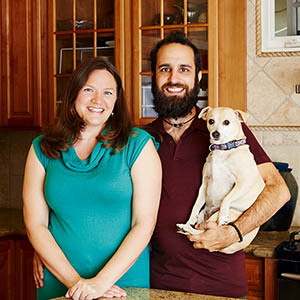 And we are excited to welcome book authors Hannah Crum and Alex LaGory, a married couple who will be part of our Brew Your Own Kombucha workshop at 1:30 p.m. on March 26. Cover art for The Big Book of Kombucha, whose authors, Hannah Crum and Alex LaGory, will be featured in a workshop at FamilyFarmed’s Good Food Festival in Chicago in March 26. Kombucha is a fermented tea that has a number of healthful properties, and can be made in a number of delicious and refreshing flavors. While there are a number of commercial kombuchas on the market, this workshop will provide what you need to know to make your own at home! We’re lucky to be able to excerpt a few segments of their forthcoming book, The Big Book of Kombucha, which teaches you how to get started brewing kombucha, and how to store and care for your equipment and the starters known as SCOBYs (an acronym for Symbiotic Colony of Bacteria and Yeast). The book is packed with recipes to flavor your drink or cook and mix cocktails with it. Crum and LaGory also teach about kombucha on their Kombucha Kamp website. To learn more about the Good Food Festival & Conference, click here. To purchase tickets in advance, click here. ‘Kombucha Kismet’ — whenever people ask how I first discovered kombucha, that is how I describe the experience. In Turkish, kismet means “fate” or “your lot in life” and is derived from the Arabic root word qasama (to divide). As someone who enjoys digging into the root of problems, words, and mysteries (I’m a total word nerd! ), looking back it makes sense that my first experience with kombucha in 2003 marked a clear divide in my life path. At the time, it was simply a curious stop on a fun tour of a college friend’s groovy San Francisco apartment, full of neat things I hadn’t considered: a filter on the shower head (of course, get the chlorine off your skin! ), pink Himalayan salt (salt is good for you? ), and kombucha. While Alex and I didn’t even taste their homebrew (not ready yet), my appetite to learn more had been piqued. Not until a week later, when I purchased a couple of bottles at the West LA Whole Foods, did I even get my first taste. The bright-white lights of the display case illuminated the neat rows of amber and jewel-toned liquid, complete with similar floating globs to the jars I had spied in San Francisco. I couldn’t wait to finally sip this mysterious brew, so I popped a bottle right there in the aisle before checking out, and when the tangy GT’s Gingerade hit my tongue, wow! It was electric! Every nerve ending in my body instantly lit up, and in hindsight, I do recall angels in heaven singing hallelujah as divine light shone around me and the kombucha — LOVE at first sip! Whether the many legends surrounding kombucha’s origin are literally true or more symbolic and mythical is shrouded in the mists of time. While some of the legends seem unlikely, there is a kernel of truth at the heart of each one — the power of kombucha, with its healing properties and “otherness,” has always been palpable to those who brew it, drink it, and pass it on to friends. Yes, but how do you think it really all started? 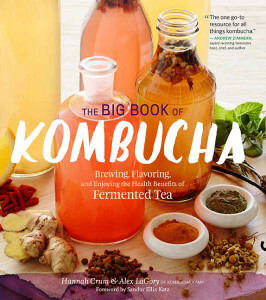 Hannah Crum and Alex LaGory are the authors of The Big Book of Kombucha and will be featured at a kombucha-making workshop at FamilyFarmed’s Good Food Festival on March 26. After all our research, what we think happened is that centuries ago, someone left out a cup of sweetened tea or sweet wine. An insect or two landed in the cup, leaving behind Acetobacter that colonized with some local yeast and began the very first kombucha ferment. The person who discovered the fermented tea relied on his or her own senses — a practice we have nearly lost — to detect a delicious brew. This lucky discoverer then threw the whole thing into another batch of sweet tea, and thus the “culture of kombucha” was born. The fact that the SCOBY can be a host to several different types of bacteria and yeast indicates that it likely can thrive in a variety of locations. The warmer temperatures preferred by the culture certainly hint at more tropical origins; however, as the technology of fermentation was already strong within all of the ancient cultures, it is not a far stretch to imagine that once they discovered it, the peoples of that time would know how to nurture a ferment. So quick! Get a Saturday Good Food Festival ticket now and catch Hannah and Alex in person teaching the Brew Your Own Kombucha workshop along with Susan Fink of Karma Kombucha and Alla Shapiro and Vanessa Tortolano of NessAlla Kombucha. You’ll also be able to pick up a signed copy of their book, The Big Book of Kombucha, at the booth of our bookseller, the Read It & Eat cookbook store and event space in the Lincoln Park neighborhood. Power up with the probiotic duo of kombucha and kefir. This drink is smooth, creamy and loaded with nutrition, plus you can mix and match fruits and flavors to create a zillion combos. 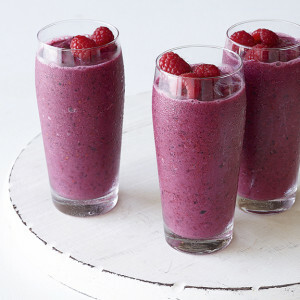 Combine the berries, kombucha, juice and kefir cheese in a blender. If you’re using fresh berries, add 1 to 2 cups of ice cubes; skip the ice cubes if you’re using frozen berries. Blend well, adding more kombucha if necessary for a smooth texture. Extra smoothie may be stored in the fridge for up to 24 hours. Excerpted from The Big Book of Kombucha © Hannah Crum and Alex LaGory. Photographs by ©Matt Armendariz. Used with permission of Storey Publishing. This entry was posted in Cookbooks, Craft beverages, Fermentation, Food and health, Food Artisans, Food Entrepreneurs, Functional foods, Good Food business development, Good Food Festivals, home cooking, Nutrition, Recipes and tagged FamilyFarmed, Good Food Festival, Good Food Festival & Conference, Hannah Crum and Alex La Gory, homemade kombucha, Karma Kombucha, kombucha, NessAlla Kombucha, Read It and Eat store Chicago, The Big Book of Kombucha. Bookmark the permalink.